Have you ever seen the windows of University Hall illuminated by candles? We can thank George Washington’s stroll on the Main Green after Rhode Island joined the Union in May 1790 for this enduring tradition, which has persisted for 228 years. The next day, Washington met President Manning at University Hall, where Washington said, “I am sure to find in the measures adopted by the guardians of literature in this place, for improving the morals of the rising generation, and inculcating upon their minds principles peculiarly calculated for the preservation of our rights and liberties.” From the year that Rhode Island joined the Union, Washington’s visit legitimized the University as a place for “guardians of literature” for hundreds of years. The strength and endurance of the tradition is evidence of Brown’s high regard of Washington as a fundamental character in the history of the university. Founded in 1764 as the third college in New England and the seventh in the United States, Brown participated in and was impacted by the Revolutionary War. British troops attacked Newport and President Manning was forced to close the college, which wouldn’t reopen for six years. 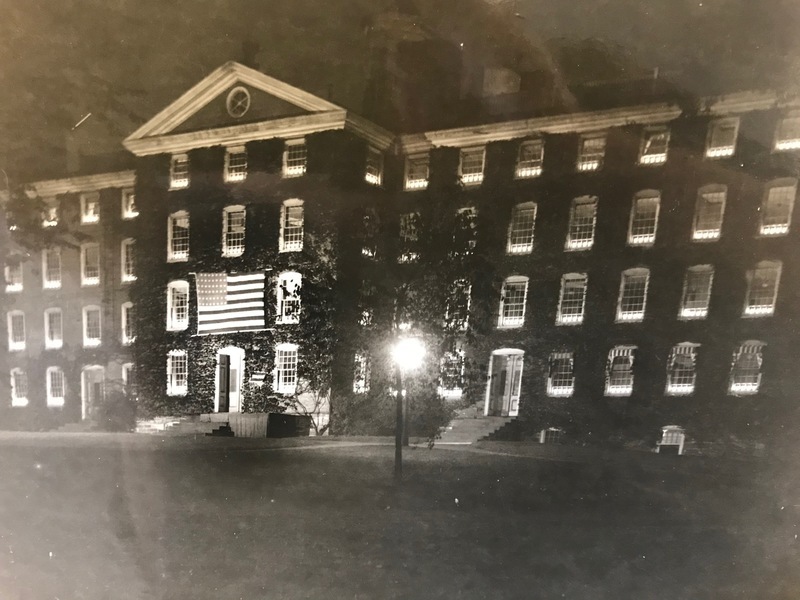 Many students joined the war effort and University Hall served as military barracks for American troops and hospitals for French soldiers. 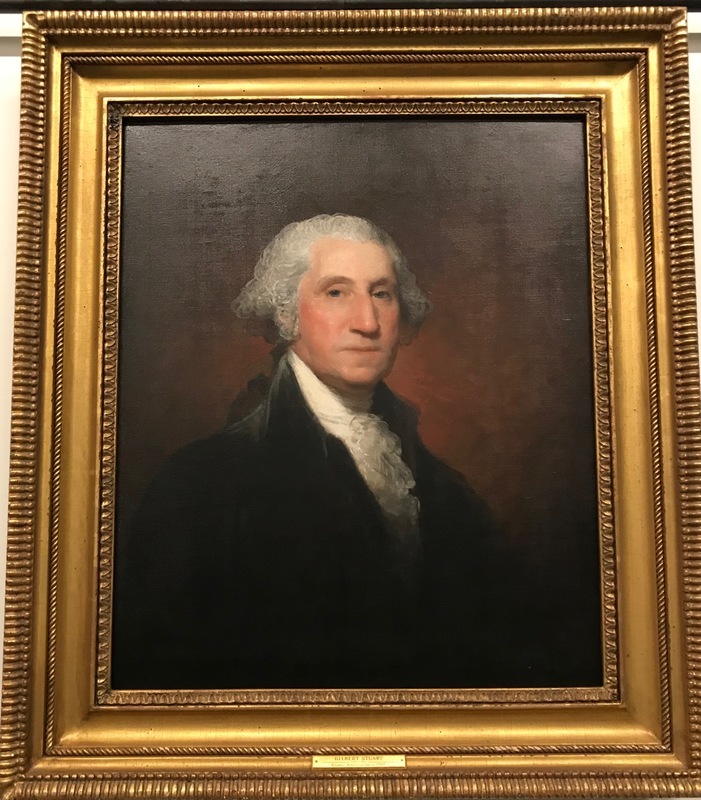 Contrast the portrait of Washington through the candlelight tradition with that of a more traditional painted portrait. The John Hay Library has a famous portrait by Gilbert Stuart on loan, and the RISD Museum’s Pendleton House has a permanent one in their collection. In addition, take some time to look at the other plaques on the outside of University Hall. One marks the building as a Historic Landmark and one commemorates Nathanael Greene, one of George Washington’s most trusted officers. Greene was born in Rhode Island to a Quaker family, and he struggled to reconcile the Quaker’s strict pacifism with his passion for military science. 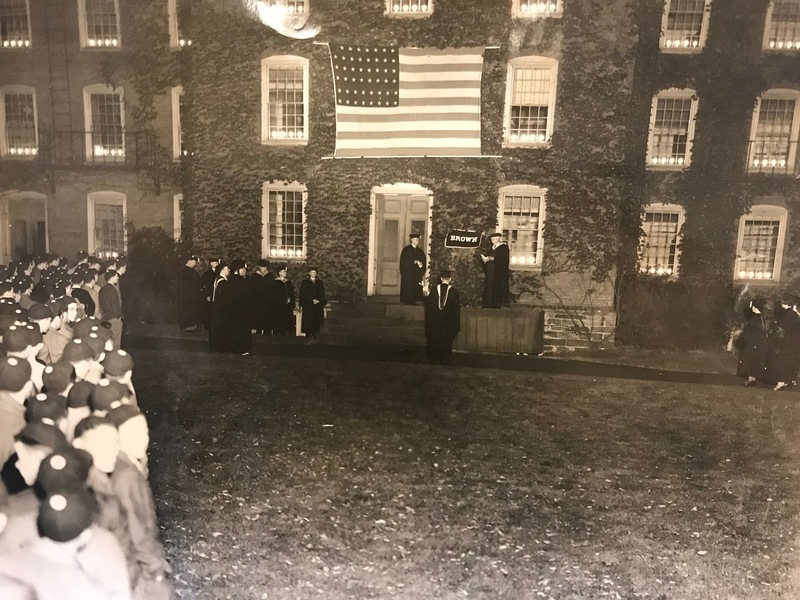 Think about University Hall’s connections and position in American history, which was designated as a Registered National Historic Landmark by the National Park Service in 1963. The Quakers had a large presence in Rhode Island and were known for their anti-war and abolitionist beliefs. Think about the multitude of lives University Hall has touched throughout its history -- slaves, George Washington, Quaker Nathanael Greene, and now you. In addition, do we have a standard narrative of “Colonial America?” What is the story of Colonial America that is taught to us, and how much do we take the time to challenge that story? If we think about the language, how does the term “colonial” interact with that of “America” as born from revolution and independence? 1 Prospect St. Providence, RI 02912 ~ Find the plaque on the West side of University Hall to the right of the steps. Maya Omori, “(Still) Waiting for Washington,” Rhode Tour, accessed April 23, 2019, http://rhodetour.org/items/show/345. 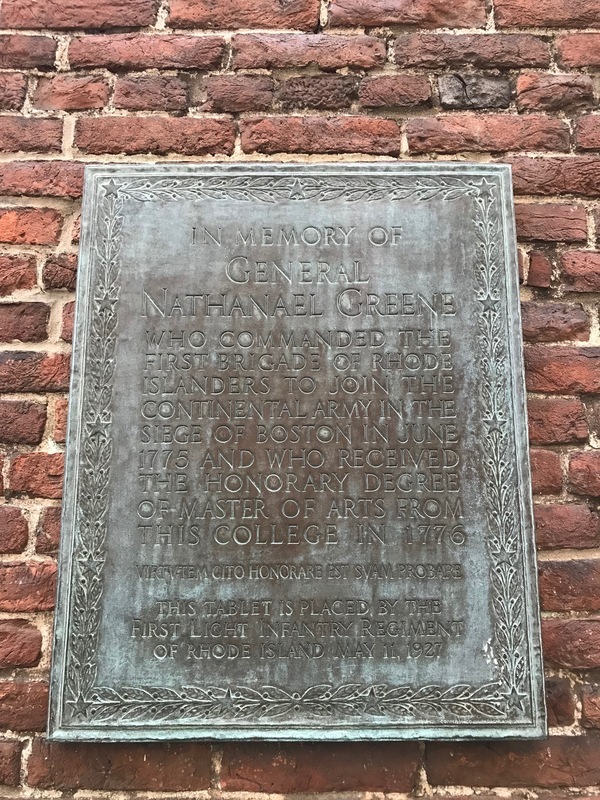 "Nathanael Greene." American Battlefield Trust. August 06, 2018. Accessed March 10, 2019. https://www.battlefields.org/learn/biographies/nathanael-greene.